The Swarovski Woodpeckers ‘Sharing’ was the second Swarovski SCS crystal figurine. These Woodpeckers were another amazing work of art. A title plaque for the 1988 SCS annual edition was offered to SCS members an an optional accessory to the AE Woodpeckers, from the Caring and Sharing trilogy. The Woodpeckers Plaque is identified using reference # SCMRP88, which was originally used in the Warner’s Blue Ribbon Books on Swarovski catalogue of recommended insurance values . 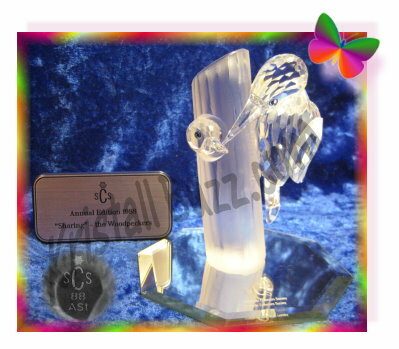 We believe that the Swarovski Woodpeckers Stand and Swarovski Woodpeckers Plaque were sometimes sold as a set. Crystal Exchange America has seen just a couple of them that come together, in a small Swarovski gift box that matches the silver and blue color coloration of the Swarovski Caring and Sharing trilogy SCS boxes. A special thanks to Jane Warner, co-author to Warner’s Blue Ribbon Books on Swarovski for consulting on the Swarovski Woodpeckers Plaque article. 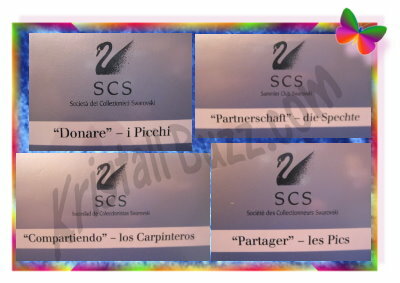 The SCS Swarovski Woodpeckers Plaque is not always easy to find, so placing a replacement value on it can be tricky. 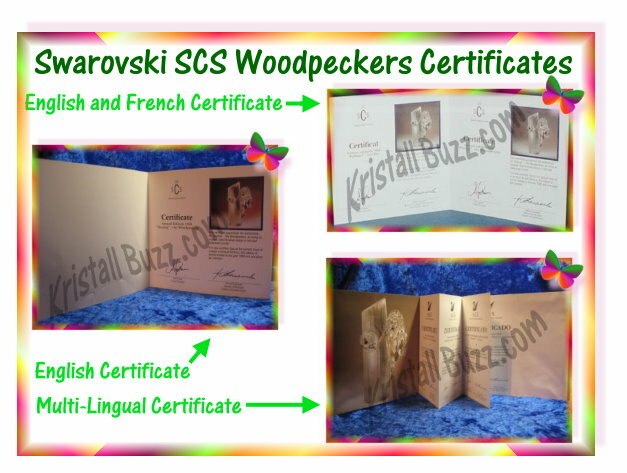 Crystal Exchange America, presently has a single listing for Swarovski Woodpeckers Plaque that is over $175 with their commission. There are a couple plaques in the online auctions ($135 to $150), but remember that auction items may be sold quickly and then not available for a long time to come. The second Swarovski SCS crystal figurine was the Swarovski ‘Sharing’ Woodpeckers. These Woodpeckers, part of the Caring and Sharing trilogy, were certain to be treasured by the SCS member. Just like the Swarovski Lovebirds, Swarovski offered an optional display stand with the 1988 SCS annual edition. The Swarovski Woodpeckers Stand is very similar to the Lovebirds stand…It is mostly thin plastic with a cardboard base underneath. The SCS Woodpeckers Stand is navy on the surface, and has a velvet-like texture. The underneath side appears to be black cardboard. The round cut-out on the top is a perfect match to the frosted Woodpeckers trunk, which gives it further stability not seen by many other display stands. The Stand for Swarovski Woodpeckers Sharing can be found using reference # DO1X881S, which is used by Crystal Exchange America. The Swarovski Woodpeckers Stand is not included in the Warner’s Blue Ribbon Books on Swarovski Price Guide. The SCS Swarovski Woodpeckers Stand is not easy to find, so determining a value on this stand is more difficult. Remember, the Lovebirds were very limited in terms of distribution. Crystal Exchange America does have a couple Swarovski Woodpeckers Stand units available in the range of $135 – $185. We have not found too many Swarovski collectors purchasing them, but they are available for collectors who want to have every possible accessory to go with their Woodpeckers. The Swarovski Woodpeckers was the second Swarovski SCS crystal figurine produced. It was in the Swarovski Caring and Sharing trilogy. To date, the SCS Woodpeckers are the only SCS figurine to ever include a special mirror. The Swarovski Woodpeckers Mirror is an octagon shape (8 sides), about 4” in diameter. The mirror has a beveled edge and is accented with an official Swarovski logo. There are two different official Swarovski Woodpecker Mirror displays. The only difference in the mirrors is the Swarovski logo that is present on the mirror. The Woodpeckers ‘Sharing’ Mirror, variation 1 (as it is referenced in Warner’s Blue Ribbon Books on Swarovski) has the sCs logo painted on it. This Sharing Mirror can be reference using identification # DO1X881M V1, as originally used in Warner’s Blue Ribbon Books on Swarovski. Crystal Exchange America presently has this SCS Woodpeckers Mirror available for $175 to $200. The Woodpeckers ‘Sharing’ Mirror, variation 2 (as it is referenced in Warner’s Blue Ribbon Books on Swarovski) has a Swan logo painted on it. This Sharing Mirror can be reference using identification # DO1X881M V2, as originally used in Warner’s Blue Ribbon Books on Swarovski. 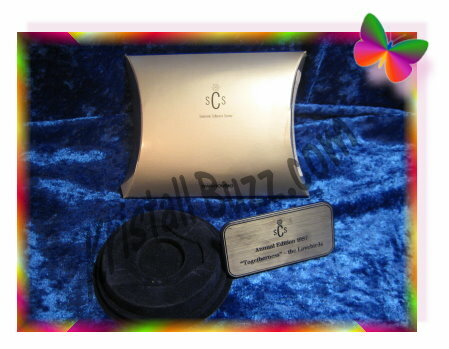 Crystal Exchange America presently has this SCS Woodpeckers Mirror available for $70, but it is not in MINT condition. 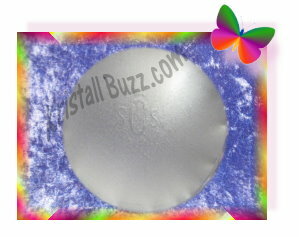 Many collectors report to us that their Swarovski Woodpeckers did not include a mirror. While we do believe them, the crystal brand indicates that all Woodpeckers included a mirror in the box, especially since there is a slit in the foam for the mirror. The only possible explanation that has been offered is that perhaps it was removed by retailers before the SCS member took the Woodpeckers home. A special thanks to Jane Warner, co-author to Warner’s Blue Ribbon Books on Swarovski for consulting on the Swarovski Woodpeckers Mirror article. The Swarovski Mirror Variation 1 is the more common of the two mirrors produced, at least that is true in the USA. It is easier to find this mirror at reputable broker sites and in the online auctions. Replacement cost for either Woodpeckers Mirror is in the $75 – $200 price range, depending on the source. If purchasing a replacement mirror, carefully inspect it for scratches on the reverse side (they sometimes show through), tarnished edges, and unflaking paint on the logo to ensure the mirror has like-new qualities. 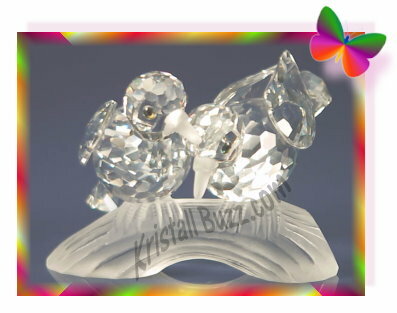 The very first Swarovski SCS crystal figurine was the Swarovski ‘Togetherness’ Lovebirds. These Lovebirds were an outstanding figurine, to be cherished by the SCS member. Swarovski offered more than just the figurine, they also offered an optional display stand with the 1987 SCS annual edition. The Swarovski Lovebirds Stand does not compare to the effort and presentation that we think of when the term ‘display stand’ is mentioned along with ‘Annual Edition’. 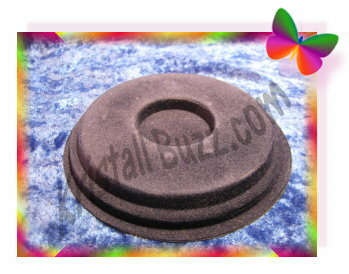 The Lovebirds stand is mostly thin plastic with a cardboard base underneath. The SCS Lovebirds Stand is navy on the surface, and has a velvet-like texture. The underneath side appears to be black cardboard. (And I’m not going to disassemble it to figure out what is in the middle.) The cutout on the top is a perfect match to the frosted Lovebirds base, which gives it additional stability not seen by the presentation stands produced in the 90’s and into the first decade of 2000. The Stand for the Swarovski Lovebirds Togetherness can be found using reference # DO1X861S, which is used by Crystal Exchange America. The Swarovski Lovebirds Stand is not included in the Warner’s Blue Ribbon Books on Swarovski Price Guide. 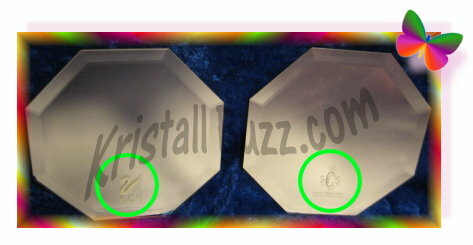 Based on collector reports, it appears that the Swarovski Lovebirds Stand and Swarovski Lovebirds Plaque were sometimes sold as a set. Crystal Exchange America has seen just a couple of them that come together, in a petite Swarovski gift box that matches the silver and blue color configuration of the Swarovski Caring and Sharing trilogy SCS boxes. The SCS Swarovski Lovebirds Stand is not easy to find, so determining a value on this stand is more difficult. Remember, the Lovebirds were very limited in terms of distribution. So, of those SCS members that purchased the figurine, what percentage actually procured accessories to go with the Lovebirds? 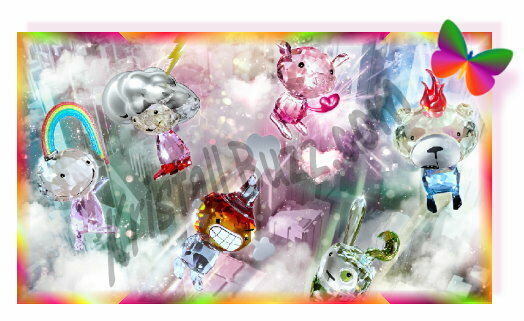 I did find any ongoing transactions anywhere for the Swarovski SCS Lovebirds Stand! 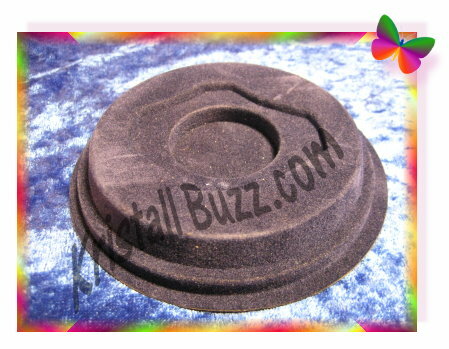 I found a couple completed auctions (Feb, 2012) on ebay for “Lovebirds Stand”, but without being able to see a picture or review the item description, I cannot be for certain it is the correct stand. But if one wants to assume they are valuation, each were sold at $199. It is not fair to draw conclusion on value based on out-dated pricing as re-sale prices fluctuate based on availability as well as the state of the economy. That being said, the last two transactions for the Lovebirds Stand at Crystal Exchange America were back in 2007. Both Swarovski Lovebirds Stand units sold in the price range of $155 – $180. Would a Swarovski collector pay that now? Would they pay more than that now? In short, it all probably all depends on the condition how badly a collector wants it. If the ebay auctions were indeed for the same stand, this would show that the value of the Swarovski Lovebirds Stand has not dramatically changed in the past 5 years.